She doesn't have any earpiece or earplug in her ear. But in next shot she pretends like she is hearing from other correspondent. How can a cameraman appears in his own video. If other camera person is shooting, then why she is speaking towards that camera. Have you ever seen someone calling from walkie-talkie to mobile phone. 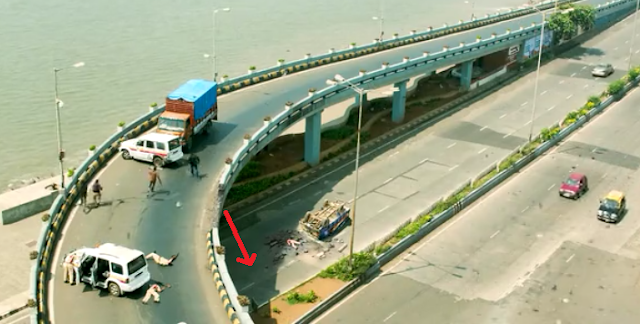 When police van falls from the flyover, it falls beneath it. But it is shown far away from the flyover. Here see the cut mark on the neck of Akshay Kumar. Now it disappears. This cut mark on his neck keeps appearing & disappearing during the whole movie. Check yourself out the difference between the same rangerover in two different scene. There is nothing on the dashboard of the vehicle. Suddenly the Indian flag appears on the dashboard. This car also changes its appearance during transit. In this picture, it has a mirror attached to bonnet.